When it comes to scooters, Razor is surely at the forefront of the industry. In fact, if you remember the scooter craze from the early 2000s, it was actually Razor scooters who kicked this all off. Thus, I am pretty sure they know what they are doing. There are a lot of products in the Razor range, all of them are incredibly distinct from one another. This made it terribly difficult to choose the top 3 Razor scooters for adults. I am positive that if another person was creating this list, they would have come up with a drastically different one. However, I am also positive that no matter what scooters were included on the list, it would still be a good list and nobody would be disappointed with the inclusions as long as they’re Razor scooters. When creating this list, I decided to choose one scooter from each of the three main ranges that Razor offers. This should also give you an idea of their ranges. Before we start listing which Razor scooters are the best, it is worth to talk about why this company is so good in the first place. I don’t know if you are aware of this, but many of the scooter companies on the market do not make the scooters themselves. In fact, they seem to be buying in generic scooters, slapping their name on it and calling it a day. This is not how business should be done. In my opinion, any product, scooter or other, needs to be strictly controlled when it comes to manufacturing. The company selling it needs to know everything going on during manufacturing process to ensure they are able to create the best scooter possible. Razor makes sure of this. They have full control over every single stage. The result is a better-built and safe product. This is a company that truly innovates too. While they could have easily rested on their laurels once they had a bit of success back in the early 2000s, they managed to improve their most popular design to create a scooter which is similar in functionality, but performs a lot better. Basically, when you buy a Razor scooter, you can be assured you are getting something which stands head and shoulders above the others on the market. I am going to start this list off with a simple kick scooter. In fact, the Razor A125 is not that much different from the Razor scooters which were popular around the early 2000s. If something isn’t broke, why should you fix it? The interesting thing about this scooter is that it is made for all age ranges. 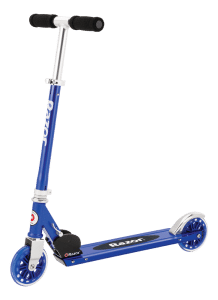 Yeah, I know that I am focusing purely on the best Razor scooters for adults, but I do want to point out that this scooter is made for the ages five and up. Why is this a good thing? Well, most of the scooters on the market will not go this low in age when made for adults. This is because they require a certain amount of weight in order to be stable. The fact that this scooter is suitable for anybody from age 5 up to 99 demonstrates just how stable the scooter actually is. It does not rely on the weight of a person to keep it functioning. This scooter has a maximum weight limit of 220lbs. One of the biggest changes from the original scooter to the Razor A125 is the fact that this one uses aircraft grade aluminum. This is a much tougher material and it is tough to break with. I mean, you would have found it tough to break with even with the steel tube on the older scooters, but this one is going to be even tougher than that. It helps keep the weight down too. The A125 weighs only 6lbs, which means that it is super easy to transport, particularly as it folds up pretty flat too. This really does mean that it is a perfect commuter scooter. I have ridden a lot of kick scooters in my time, and the majority of them have awful brakes. You can’t really rely on them when you are travelling at speed. While I still wouldn’t want to be braking at a whopping speed with the A125, I am a lot more confident in its braking powers than other scooters on the market. It seems to be incredibly responsive, although it would have been nice if there was a way to access the brakes from the handle too. The only real downside of the A125 is something that most kick scooters out there have in common. It’s the fact that it is not built for travelling on anything but paved surfaces. The urethane wheels don’t have much grip which means you are going to be slipping and sliding whenever you are on an even slightly rocky road. That being said, most of the people who ride kick scooters do not go on these kind of roads making it a minor issue. 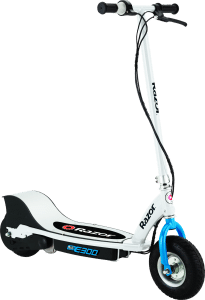 There are a few different scooters in the A5 range of Razor. Each of them has a different functionality. For example, the A5 Prime is built for taller riders. The A5 Lux is built for maneuverability, which makes it ideal for doing tricks. This one, the Razor A5 Air is built for uneven surfaces. This scooter is actually quite a rare find in the world of kick scooters. This is because most of the ones that you find on the market are built for paved surfaces only. While some of the ones that pop up do have air-filled tires, they never function that well. This means that if you are travelling over rougher surfaces, you will be sliding around. Don’t get me wrong, the Razor A5 Air is not a scooter that you can head off road with. It is not built for that. It may manage for a short while, but I can imagine it not being the most pleasurable ride in the world. It is still built for urban environments, but it can deal with all those pot holes that your local government hasn’t quite bothered to fill. The 60 PSI tires should be able to absorb all these shocks. It is not just the tires which have been built to handle the shocks, though. There are actually a few other features built into the A5 Air which will come in handy. For example, the handlebars are built not to rattle. I don’t know about you, but when I am travelling for longer periods of time on a scooter, I often end up getting a bit of hand pain due to rattling. This is not an issue I have had with the A5. These handlebars are covered in one of the most comfortable soft rubber grips I have ever had a chance to use. Unlike other rubber grips, you don’t really get the feeling that it will break apart in your hands. As I said before, Razor scooters are always built to last. In addition to this, the folding mechanism doesn’t rattle at all. Again, this is a problem that I have experienced with other kick scooters on the market. Sure, the rattling is not going to cause issues when it comes to riding, but it is still incredibly annoying to listen to. The scooter does weigh a little bit more than other kick scooters on the market, at 12.5lbs. However, that being said, it still is not that heavy in real life. You can easily fold it up and carry it around if you wish. It folds up pretty flat too, making it even more comfortable to deal with. One of my favorite features on the scooter is the riding deck. 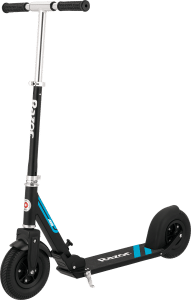 It is 13.4” in length, which is considerably longer than other kick scooters on the market, by a good few inches. This means that you have more foot room, which ultimately results in a far more comfortable ride, particularly for plus-size riders (maximum weight on the scooter is 220lbs). You would think that the brake would be difficult to access due to the size of the board too, but it really isn’t. In fact, the brake is super simple to use, and effective enough to slow you down to a halt pretty much right after using it. If that wasn’t enough to convince you, this scooter looks fabulously stylish too. All in all, it’s a true joy to ride it, and I can’t see why anybody would be disappointed with it. I am going to wrap this list up with an electric scooter. It will be the Razor E300, to be exact. As with the other products on this list, there are a lot of scooters in this range. I have selected the Razor E300 due to its versatility. The other scooters seem to have a slightly lower maximum weight, whereas the Razor E300 is suitable for weights up to 220lbs. Right off the bat, I do want to tell you that if you are looking into getting an electric scooter which can be easily carried around, the Razor E300 is definitely not the right choice. It comes in at 43lbs, and it’s going to take some serious weight training to be able to carry that around with ease. This is a scooter that is for getting you from point A to point B with no hopping on buses or other means of transport. The maximum speed of the Razor E300 is around 14 miles per hour. It is not the fastest electric scooter on the market, but I have found that it is easier to hit the maximum speed on the Razor E300 than on other scooters out there. I can’t imagine that you would need to travel faster than 14 miles per hour if you are commuting to work anyway. You will be stopping and starting too much for this to be an issue. Interestingly, Razor doesn’t really quote a maximum mile range for the E300. I have no doubt that this is down to the fact that most of those estimates are going to be wildly off anyway. I have always struggled with companies that quote ranges in miles, because we all have different riding styles. My slightly more aggressive riding style meant that I often came up a couple of miles short on the estimate. Instead, they tell you that you will get about 40-minutes of battery life on a single charge. If I had to estimate, this means that the range is somewhere around the 12 mile mark. The tires on this scooter are huge. They come in at a decent 9” in diameter. They are pneumatic tires which means that you are going to experience a smooth ride even on the rougher terrain. You still won’t be able to travel off road with this type of scooter, but you should be fine in any urban environment. You have plenty of controls on the handlebars. This includes twist-grip acceleration control, and access to the break on the handlebar. By all means you will also have access to the rear brake with your foot if you need to use it in an emergency. The kickstand which helps to prevent your scooter falling over while in storage is the final advantage to round up the features on the E300.